Zazen is a fluid thing where distinctions never match my actual experience. The cat climbs onto my lap, circles into the curve of my ankle and settles. I sink into whatever this is. This unhappy unknowing. Metta for everyone, to be well, please, to be peaceful and at ease, to be free…There is no time; or an eternity. My experience cannot be got at—the fundamental emptiness of all dharma. I sit. Each passing moment barely exists. A thump. My cat leaps. 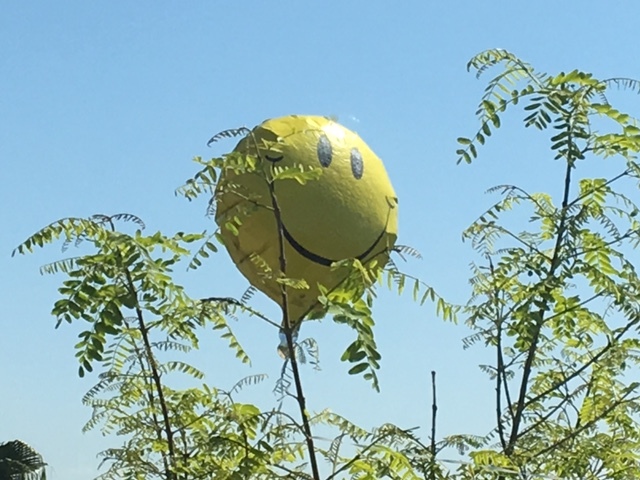 My fourth-floor window is filled with a snagged balloon—a happy face! —staring back into my room with deep humor. Perfect, a perfect metaphor of the free-floating anchor point for our illusions. I realize anything is possible because it cannot be pinned down. I can be happy knowing this wisdom.